Overlay of the predicted structures of cyclooxygenases from Nitrosomonas europeae (green), Nostoc punctiforme (blue), and Gracilaria vermiculophylla (magenta). Models were generated in Swiss-model using ovine cyclooxygenase-1 as the template. 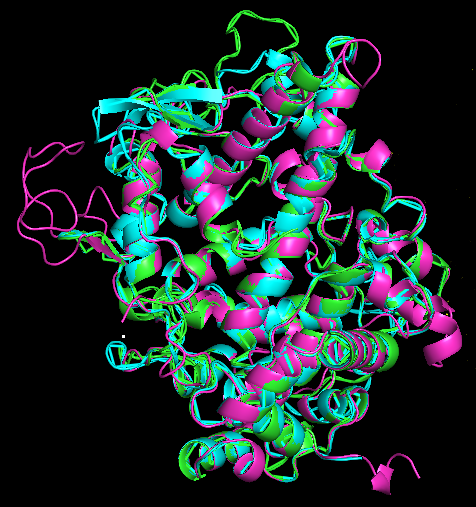 The image was generated using Pymol. Cloning, expression, purification, and characterization of putative cyclooxygenases from bacterial genomes. Cyclooxygenases are an intensely studied class of enzymes in mammalian systems. They are needed for the synthesis of prostaglandins, local messengers involved in pain, swelling, and blood vessel dilation. However, functional cyclooxygenases have been identified in invertebrates and, more recently, red algae. Open reading frames encoding for proteins predicted to be structurally similar to cyclooxygenases have also been identified. Our lab is currently subcloning the open reading frames of several of these bacterial proteins into expression vectors and expressing these proteins in large amounts. We have expressed and purified putative cyclooxygenases from two bacterial species: Nostoc and Nitrosomonas. The Nostoc enzyme functions as a 10S-lipoxygenase, while the Nitrosomonas enzyme acts as a lipid peroxidase (manuscript in preparation). We have also begun site-directed mutagenesis of the Nostoc protein, hoping to alter its enzymatic activity. Synthesis of aminosterols and characterization of these as membrane lytic agents. An aminosterol is comprised of a cholestane-like ring system with an attached amine or polyamine substituent. The most well known aminosterol is squalamine, isolated from the dogfish shark. The function of squalamine is still under investigation, but it does possess antimicrobial activity, and may contribute to the immune system of the dogfish shark. We have contributed to the total synthesis of squalamine, and have also synthesized a variety of squalamine analogs for antimicrobial testing. Our lab is currently synthesizing aminosterols based upon a slightly different cholestane backbone, which may be relevant to mammalian systems. We are also interested in synthesizing aminosterols with attached chromophores for biophysical studies. Tessema, T-D., Gassler, F., Shu, Y., Jones, S., and Selinsky, B.S. Structure-activity relationships in aminosterol antibiotics: The effect of stereochemistry at the 7-OH group. Bioorganic. Med. Chem. Lett., 23, 3377-3381, 2013.